Leona Freestanding Soaking Tub 71"
Name: Leona Freestanding Soaking Tub 71"
Leona Freestanding Soaking Tub Modern Cast Stone 71"
Transform your bathroom into your own personal spa retreat with the Leona luxury modern bathtub. 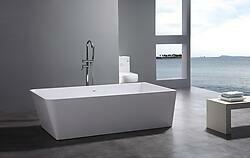 This chic solid surface stone bathtub boasts a warm and inviting polished satin matte finish. Common bathtubs found in the market today are created by joining two sheets of fiberglass and leaving an empty hollow layer between the two fiberglass sheets. 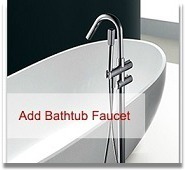 However, the modern solid surface bathtub is one solid piece made of crushed stone along with strong and durable molecular compounds and advance composite materials without gaps or hollow layers. The slick non-porous feature of this modern freestanding bathtub design works as a natural deterrent for bacteria adding hypo-allergenic and stain resistant properties, contributing to the contemporary functionality of this impressive bathtub design. The refined one piece, soaking solid surface bathtub is fully with a inconspicuous over flow carefully placed to avoid interfering with the vogue bathroom design. The sleek edges of this rectangular shaped modern bathtub adds romantic visual appeal and follows through with a silky, velvet touch. The Leona modern freestanding bathtub undoubtedly bridges the gap between attractive contemporary bathroom d?cor and reliable durability commonly assessed with traditional bathroom design. Its design will enchant you while its smooth velvety feeling will invite you to enjoy a comfortable peaceful bathing experience.